To say I’ve had a weird week is an understatement. Let’s just say work has been a little crazy and there have been some late night activities that make me very happy it is behind me now. With only a few days until Christmas… I’m seriously attempting to check everything off my to-do list. It has not been easy this week. Needless to say, I’m very happy it’s Friday, and I’m even more happy to be bringing you this amazing giveaway from SEVEN the Salon. I’m sure you remember that they gave me an amazing new hair cut and Balayage, taught me to style my hair, and sent me home with a goodie bag full of some brand new favorites. 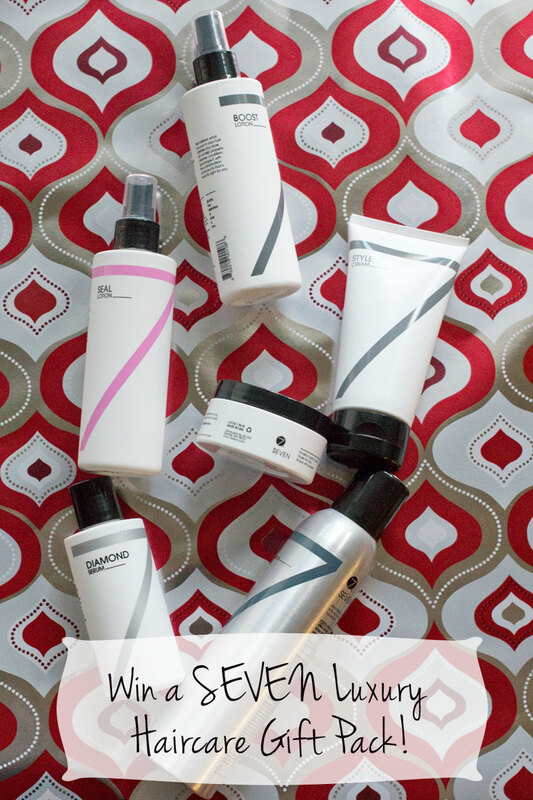 Some of those SEVEN Luxury Haircare favorites (and more, I’m sure!) will be making its way to one lucky winner. I’ll make it short and sweet, just get yourself entered below and have yourself a Happy Friday! What a lovely giveaway. Is it open worldwide? i will be putting together several bookshelves to organize the walk in closet in my new crafting room and organizing everything. also hope to get some crocheting in! also have the normal chores of cleaning, laundry, etc. I’d love to try the Diamond Serum. Macadamia Nut Oil, Coconut Oil and Vitamin E sound like it would be awesome!! Great giveaway!! My hair is definitely in need of some TLC, that’s for sure. haha! This weekend is full of last second shopping and holiday events for us. lol! I haven’t heard of this brand before, I will have to ask my stylist about it. I would really like to try the boost. My hair is thin and fine and is super finicky. I really want to try the Diamond Serum! I want to try the BOOST Lotion – anything that increases shine and adds volume at the root (where my hair is the ‘limpest’ from the weight of my longer length) is a winner for me!! I think that I am most excited about the refresh shampoo and conditioner! This weekend I’m going to finish Christmas Shopping and decorate Gingerbread Houses and do some cookie baking. Sounds like fun – good luck, Kimberly! Sounds great, I need to give my hair a little love! Good luck with those last minute Christmas tasks – there’s always something that sneaks up on us no matter how organised we try to be! Thanks so much Mica – you’re so right, always something last minute! I hope you had a lovely holiday! Sounds like a great salon, which for me has been hard to find… the products sound great! Heading to my holiday work party tonight! Have never tried any of these products…so would be thrilled to get a chance to do so! Fun giveaway! This weekend I’m inviting a friend over for a total cleaning/re-organizing of my apartment. We’re fueling it with Michael Buble’s Christmas Album and Starbucks lattes! I’ve not heard of these product but I’m always on the cautious side with my coarse & coily afro textured hair.. thanks for sharing. Would love to try this product! Thanks for bringing us a great giveaway! You’re very welcome, thanks for entering, Claire! Ah! How fun! I have to admit that I never put anything in my hair…like ever! Besides shampoo and conditioner of course. But I’ve been wanting to test out a few serums and sprays for texture! I would love to try the volume line and the mend line. I feel ya on the crazy month! Why is work always the worst in December when we’d rather be having holiday fun? I should look into these. My hair could really use some TLC. This weekend is all about baking, eating, and relaxing! Sounds like a great plan – hope you enjoyed it! Happy Holidays! I would love to try their volume conditioner. So luxurious! Thank-you for the generous chance! Of course, thanks for entering, Natalie! Looks like a great line of products; I’m most interested in the seal lotion. This weekend, I’ll be cleaning up from Christmas. I your holiday was lovely.